WEST PALM BEACH, Fla. /Florida Newswire/ -- OpenClose, a multi-channel loan origination system (LOS) mortgage software provider, announced that it earned a spot on National Mortgage Professional magazine's (NMP) annual Top 100 Mortgage Employers list for 2017. SAN FRANCISCO, Calif., May 12, 2016 (SEND2PRESS NEWSWIRE) -- EPIC Insurance Brokers and Consultants (EPIC), a retail property and casualty insurance brokerage and employee benefits consulting firm, announced today that Liz Miller has joined the organization's employee benefits division as a senior communications consultant. Miller will be based in EPIC's San Francisco headquarters and report to John Gaffney, director of national benefits operations. LOS ANGELES, Calif., March 22, 2016 (SEND2PRESS NEWSWIRE) -- After directing over a dozen short films, French filmmaker Tristan Convert announced he has directed his first feature, 'SCRATCH,' an original horror comedy starring Daniele Watts ('Django Unchained'), for which he has launched an Indiegogo campaign, to reach $10k for finishing funds. Set in Los Angeles's known-to-be haunted Old Zoo, 'SCRATCH' is one of the first, if not the first, found footage films shot entirely on iPhone 6. SAN FRANCISCO, Calif., March 22, 2016 (SEND2PRESS NEWSWIRE) -- EPIC Insurance Brokers and Consultants (EPIC), a retail property, casualty insurance brokerage and employee benefits consultant, announced today the addition of veteran construction broker Brian McDonnell as a managing principal, and the formation of the EPIC National Construction Specialty Group. SAN FRANCISCO, Calif., March 8, 2016 (SEND2PRESS NEWSWIRE) -- Business leaders are too often faced with spiraling health costs that take a financial toll on their organization. However, these costs can be confronted through health and wellness programs that not only promote a healthier workplace, but also increase productivity. EPIC Insurance Brokers and Consultants, a retail property and casualty insurance brokerage and employee benefits consultant, today announced its Way2Wellness webinar on Health and Productivity Management (HPM) on Tuesday, March 15 from 10 a.m. to 11 a.m. PDT. ALBUQUERQUE, N.M., Jan. 22, 2015 (SEND2PRESS NEWSWIRE) -- Daniel P. Douglas announces the release of a new short story entitled 'Glimpse,' a science fiction Cold War suspense thriller published by Geminid Press, LLC. In 'Glimpse,' a small group of agents who will become known as the 'Men in Black' deploy in response to an event that will provide a harrowing glimpse into humanity's apocalyptic future. SAN FRANCISCO and LOS ANGELES, Calif., Jan. 21, 2016 (SEND2PRESS NEWSWIRE) -- EPIC Insurance Brokers and Consultants, a unique and innovative national retail insurance brokerage and employee benefits consulting firm, announced today that Clarence Bates has joined the firm as a Principal in the Employee Benefits Practice. HOUSTON, Texas and SAN FRANCISCO, Calif., Jan. 7, 2016 (SEND2PRESS NEWSWIRE) -- Ascende, Inc. (Ascende), a premier human capital and employee benefits consulting firm, and EPIC Insurance Brokers and Consultants, a unique and innovative national retail insurance brokerage and employee benefits consulting firm, announced today that they have joined forces. SAN FRANCISCO, Calif., Oct. 14, 2015 (SEND2PRESS NEWSWIRE) -- EPIC Insurance Brokers and Consultants, a retail property, casualty insurance brokerage and employee benefits consultant, has received top rankings from Business Insurance Magazine in its 2015 Broker Supplement in three categories. OSCEOLA, Iowa, Oct. 12, 2015 (SEND2PRESS NEWSWIRE) -- With a visit to Altec, Inc. in Osceola, Iowa last month, Governor Terry Branstad doubled up the perception of positive manufacturing growth throughout Southern Iowa. Quickly following up an agribusiness / manufacturing visit to the community from Secretary of Agriculture, Bill Northey, the feeling in Osceola and surrounding communities is recent manufacturing growth is making a significant impact. RICHMOND, Texas, Sept. 28, 2015 (SEND2PRESS NEWSWIRE) -- Restaurant Owner, an industry leading resource for budding and seasoned independent restaurateurs, recently published an industry survey on the hiring and staffing issues plaguing the foodservice industry today. More than 650 independent restaurant owners responded with the unique situations they are facing in hiring and retaining their staff. OSCEOLA, Iowa, Aug. 4, 2015 (SEND2PRESS NEWSWIRE) -- The Clarke County Development Corporation (CCDC) recently released its 'Scorecard on Jobs and Compensation Update for 2004 to 2014.' The report shows, over a the last decade, the average income level for manufacturing jobs in Clarke County consistently outpaced average county compensation levels. LANSING, Mich., June 29, 2015 (SEND2PRESS NEWSWIRE) -- Just completed research by the Midwest Economic Policy Institute, Colorado State University Economist Kevin Duncan and Smart Cities Prevail - a leading construction industry research organization - has revealed that Michigan's proposed prevailing wage repeal would eliminate more than 11,000 jobs, $1.7 billion in economic output, $28 million in local and state tax revenue, and will export nearly $700 million in construction investments out of state every year. MADISON, Wis., June 2, 2015 (SEND2PRESS NEWSWIRE) -- Just completed research by Colorado State University Economist Kevin Duncan and Smart Cities Prevail Researcher Alex Lantsberg reveals that Wisconsin's proposed prevailing wage repeal (AB 32) will cost the state nearly 9,000 jobs, $1.2 billion in economic output, $77 million in tax revenue, and will export an estimated $500 million in construction investments out of state. 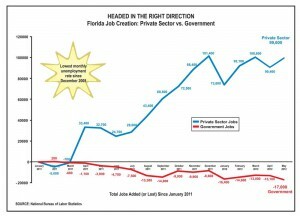 TALLAHASSEE, Fla. /Florida Newswire/ -- On Tuesday, Florida Governor Rick Scott announced the number of available online job openings in Florida increased by 8.8 percent in February 2013 compared to the previous February by 21,366, for a total of 263,240 openings (seasonally adjusted). Job postings in Florida also increased over the month compared to January 2013 by 256 openings (+0.1 percent). TALLAHASSEE, Fla. /Florida Newswire/ -- Governor Rick Scott today joined business, military, veteran and workforce leaders during the annual Florida National Guard Day at the Capitol to launch a year-long effort aimed at connecting returning National Guardsmen and other veterans with job openings as Florida's economy continues to improve. TALLAHASSEE, Fla. /Florida Newswire/ -- Florida Governor Rick Scott announced today that Florida's unemployment rate went down again in the last month of 2011 to 9.9 percent. A total of 5,100 new private-sector jobs were also added in December, solidifying Florida's status as one of the nation's leaders in job creation last year.